They’re sitting down to breakfast on a Tuesday morning at Eat ‘n Park. Eat ‘n Park, its name a misnomer to be sure, serves a senior buffet on Tuesday mornings that costs less than on other days of the week. Many elderly couples take advantage of the savings, but younger people come, too, (though they don’t get the discount) and on this morning there is a reasonable mix of young and old. One elderly woman nods at her husband, sitting opposite her, indicating he should look at the family two booths back on the opposite side of the aisle. The look on her face says everything she’s not giving voice to – at least until they get into their car. Seated in that window booth is a young couple in their late teens, maybe early twenties, looking like they just got out of bed. Their hair is uncombed, his stuffed under a baseball cap, its brim facing backwards and hers, carelessly pulled back and loosely secured in a ponytail with an elastic band. Scraggily dark strands hang in her eyes. They’re both wearing stained sweatpants and baggy shirts large enough to hide a host of sins. Their toddler is maybe 16 months old. Mom and Dad are engrossed in their food. They don’t commune with each other the entire time and only occasionally toss a word or two in the general direction of their toddler who is jumping up and down on the bench seat, stopping now and then to grab food off his plate and stuff it into his mouth with the palm of his hand. It doesn’t all get where it’s supposed to go. The waitresses walk back and forth, pretending not to notice. “Isn’t the restaurant liable for accidents?” another woman asks the waitress pouring her coffee. “Yeah, supposed to be, should be,” she says, rolling her eyes. How many of us have witnessed servers, loaded with dinner plates and trays full of food and even pots of hot coffee, nearly tripped up by little kids running around from one table to another? And their parents? They watch, laughing and beaming at other customers, waiting for someone to say how cute their little darlings are. This waitress comes back with more coffee, confiding that if she says something to the parents, they are likely to take offense, to stop coming in, and to tell their friends and family not to as well. They threaten to complain to management – who will not “have her back.” Why? Because it’s all about dollars-in versus dollars-out. So she could be subject to reprimand, possibly even fired. It’s only a matter of time until someone gets hurt and sues the restaurant. Regardless, they must remain family-friendly, the risk of lawsuits notwithstanding. Those parents (and I use the term loosely) don’t look at or speak to their child, their faces are buried in plates piled high with sticky buns and biscuits and gravy. Then the toddler slips to the floor (which may see a vacuum at the end of each day but has probably not been shampooed in years) and crawls on his hands and knees across the carpet to the opposite side of the bench where his father sits. Climbing onto that bench seat and, once again, getting to his feet, he parades back and forth, grabbing at the hair of a customer whose booth abuts the one behind them before plucking some bacon from Daddy’s plate. And let’s not forget where those dirty little hands have just been. The older woman, looking up from her scrambled eggs, opens her eyes wide and points, jabbing her finger in the air, telling her husband to turn around. “What’s he doing now?” he asks. The toddler is hoisting his diapered self onto the table, rising to a standing position, and begins walking back and forth on top of it. He is lovin’ it. As he stands at the edge of his mother’s plate, she looks up and says sweetly “Whatcha doin’? We’ve all witnessed something similar to this at one time or another. Kids running up and down the aisles. Kids throwing food on the floor. Kids standing on the booth or the chair, and kids going from one table to another for attention. All the while their parents, grandparents, aunts, uncles, babysitters say nothing. 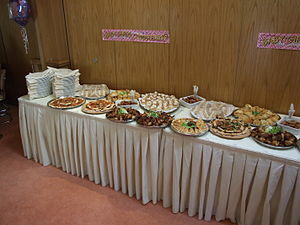 At buffets, children too little to comfortably navigate through the line are permitted to handle full plates of food on their own. They sneeze or cough across the contents of the breakfast bar because, as so many of them say, “I can do it myself.” And their parents let them. I’ve seen children who can’t manage the tongs just pick up the food they want with their fingers, some of which have recently been on that dirty carpet or been intimately involved in their noses. I kid you not. Too many parents push their kids to center stage. That way everyone can gush over them and say how cute there are. Do we really need more narcissists than we already have? The sad thing is, it’s not the child’s fault, yet they are often blamed. It’s the parents and often other adults in their lives that are encourage this, that teach those kids – by not teaching them – that the world revolves around them. It’s a lot of work to be the responsible parent – and parenting is probably the toughest job there is, one that requires the most attention you’ll ever give anything. When are restaurants and the responsible adults who patronize them going to stand up and say “Enough Already” – kids don’t belong in restaurants if they can’t behave while they are there. Only the irresponsible adults will complain but, hey, that’s just too bad. Kids, just like anything else in life, come with responsibilities and consequences. A few months ago there was a news story about a restaurant that rewards parents of well-behaved children by giving them a discount if they don’t stand on the seat, if they don’t bother other patrons, if they don’t throw food on the floor, if they don’t get up and walk around. Following the rules doesn’t just happen, you know. These are learned behaviors which parents must model and teach. And for the parents of children who do, there awaits a $4 discount on their bill at the cash register. What a great idea. All restaurants should do the same. When I’m out, I make a point to congratulate people whose small charges are well-behaved. I tell them, and their little ones, how nice it is to see children who are respectful and well-mannered because, today, that’s the exception rather than the rule. The elderly couple watching this family scene across the aisle recall a time when children were respectful and well-mannered – and that was the rule, not the exception. It’s a lot of work, but real parenting is work. Real children are work – not just dolls to play with or trophies to display. What I fail to understand is how management can respond so miserably to potentially lawsuit-inducing behaviors for which they could be held liable. And don’t get me wrong. I love kids, and I know how hard it can be to take them anywhere when they’re small. But we are their guardians, their teachers, and we must do what it takes to raise good citizens and good role models for the next generation. The day will come when the restaurant industry will address this problem – but why does is always take an accident, a tragedy, or a lawsuit to get us to do what we should have been doing all along? This entry was posted in Fun With Food, On Family and Parenting, The Power of Words and tagged Eating out, Eating out with toddlers, Family, Family Restaurants, Family-Friendly, Good Manners, Narcissism, Parenting, Respect, Responsibility, Seniors, Toddler, Well-behaved Children on June 29, 2013 by lindagwhite.